The voluptuous Nigella Lawson, Queen of the cooking show and easy recipes in the United Kingdon, came to present her new cooking show Simply Nigella at MIPCOM 2015. At MIPCOM 2015 in Cannes, FremantleMedia International presented Nigella Lawson‘s new TV British series Simply Nigella including 6 cooking shows of 30 minutes each, with a one-hour show dedicated to end-of-year festivities: Nigella’s Christmas Special. 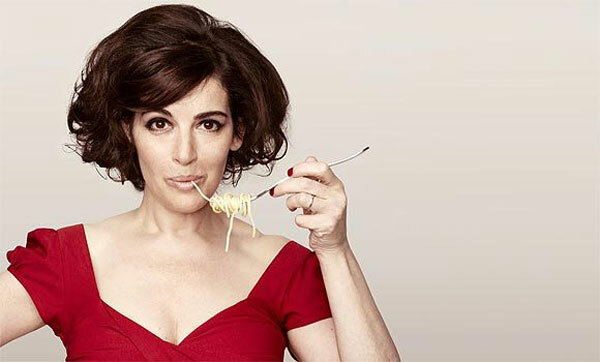 For twenty years, Nigella Lawson is calling the shots in the very masculine community of the cuisine, walking her voluptuous curves and carnivorous smile from TV shows to signings. For the occasion, Nigella Lawson visited the Croisette and played the game with an explosive photocall. Nigella Lawson is a famous British cook who, in a a few strokes of rolling pin, has become England’s sweetheart of. For many years, she has been hosting several cooking shows become cult in the “kingdom of junk food”, like Nigella Bites, Forever Summer and Nigella Express (up to 3.5 million viewers some nights), which are broadcast on Channel 4 and BBC2 in the UK and in France on Cuisine Tv. In America, she hosted Nigella Feasts on Food Network. Nigella will offer mouth-watering menus composed with delicious stress-free dishes. Simply Nigella will be aired on four international channels: Prime (New Zealand), Foxtel (Australia), TV2 (Norway) and Discovery Networks (Asia-Pacific). Nigella Lawson is a UFO who is playing with all the clichés of the cooking show. When welcoming the viewers in her beautiful house (that we imagine in an upscale London neighborhood) and in her nicely decorated kitchen, her humor and love of food radiates in front of the camera. In each of her shows, everything that is prepared is duly tasted, swallowed, devoured. One can also see her consistently reappear after the end, after the credits, for a night tour of the fridge (like munchies at 3am) for a chicken/mayonnaise/pastrami/pesto/cheddar sandwich. She is feasting, enjoying,she has fun. Well, yes, obviously it’s not very politically correct. She just motivates us to start cooking and remove the most novice of us any inhibitions. Nigella Lawson culinary recipes are simple and delicious, to eat without without sacrifice. Nigella Lawson is also the author of several best-selling books that have sold over three million copies worldwide. Each book contains chapters with evocative titles: “Hurry up, I’m hungry,” for short, quick dishes to make, “Take It Easy” for more elaborate dishes, or “Remedies to fight against “sundayeveninghood”. Her recipes are generally tasty and accessible to all. Nigella Lawson’s recipes are true to her personality, bright and cheerful. The pages of her books are imbued with her love of life and generosity. The course of her recipes is very clearly detailed, with great photos and peppered with anecdotes and practical tips. Some gourmandises for all occasions, that pleasantly stimulate the appetite and imagination!